Devices, literally anything can be bought just in two clicks on any web-store. It’s not a big deal anymore, but there are things that you couldn’t buy online. Like a car! You can go the standard route by driving to a dealership, wasting your time on wandering around and listening to a salesman, who will push you into purchasing expensive extras, that you don’t really need. Or… you can simply do your own research: use the Internet, read reviews, google (or bing!) things up, get all the gigabytes of information and determine what type of car do you want and make a deal without even rising from the sofa. In pursuit of innovation and claiming the new source of sales, a European car manufacturer gave us a challenging task to develop a CRM (customer relationship management) solution, altered to the needs of motor vehicle trade specifics. What did we have to do? Our client request was to create a data warehouse that would contain all customer information in one place. It should had been easy to use: we had to keep in mind that collected data will be used by people from different departments and for various purposes, and that actually made our task more complicated and at the same time more interesting. Besides that, the client wanted to track customer behavior, their needs, and likes — and information on this should had also been stocked in the data warehouse. Summing up: we had to build a CRM-system that would have been operational, analytical and collaborative — all at the same time. Default functionality of OroCRM has a resource to implement this idea into life, and that’s why we chose it — what we had to do was to customize it to our clients needs. From the development side, there are different systems that collect and save customer information — some of them are custom developed for this project, and others are ready-to-use solutions. No matter what they are, they come with separate databases. Since we had to consolidate all the customer data in one place and keep it in perfect order, a big part of the project was about connecting these systems to OroCRM. In the result there should be a one simple OroCRM based system instead of separate ones. How is the data organized? Let’s now take a look into what those systems are and how is data flow organized between each of them and OroCRM. Marketing analytics system. Third-party service. This marketing tool is used to track website behavior to collect information like page visits, cars viewed, etc. We built a module in OroCRM that connects to a FTP server containing XML file that contains any new Lead and Finance proposal information from marketing analytics system. It does this every 15 minutes. On-premise CRM. Third-party service. Another CRM-system that allows to easily log, manage, and analyze all customer activity. Orders can be processed in OroCRM, but in conformity with client’s request we built an extension that aggregates all the data from all services — it consists of approximately 900–1000 parameters (600 of which are only finance) then merges it into a single customer view and sends it to on-premise CRM. Created order can be processed in a minute or less. We connected to on-premise CRM by using its REST API. There has been created a new module in OroCRM that runs on certain interval, checks if there is any new information that should be exported to on-premise CRM and sends it there through REST API. Finance data application. Custom developed service. Collects and then sends to OroCRM finance, finance quote, finance proposal, dealer data, delivery wishes, and personal data. The finance data app personal information rewrites some of the trade-in deals application information in OroCRM. The finance data app information can be also modified in line. IgnitionOne integration. Custom developed service. Collects and then sends to OroCRM all the data on insurance claims: personal details (including job, etc) and information on any other possible drivers (spouse, additional drivers, etc. ), so a customer can get the best insurance offer for a new car. Anyone can modify the insurance claims application data via OroCRM. That’s how all the customer data is stocked within OroCRM warehouse — and the question you possibly now have is: how do you manage it? To automate sales and marketing for our client we customized OroCRM basic tools. Contacts & Leads. Lead can be created from multiple sources. The source can be insurance file (info that customer left when applying for insurance), part exchange valuation (info that customer provided while valuing the car for exchange) and the finance data app. The data can come from multiple sources and will be merged into single lead based on customer email. Lead can be created manually as well. Each lead or insurance file or other important information is separated by brand — there can be any amount of brands. Contact can be created without lead if there’s not enough information to generate it. Bonus: a customer can visit the site, fill in his application partially, them leave and come back later. The system will recognize him (finance data app provides trade-in deals app & insurance claims app ID along with data for import) and merge all the data provided during the visits into a single lead. Export & Import tool. Insurance claims and trade-in deal requests are generated by OroCRM automatically but then have to be processed manually. To make this process simple we customized OroCRM basic export/import tool. OroCRM has a default functionality that allows import entities into or export them out of the system. As we needed OroCRM to export and import only the data on insurance claims and trade-in deal requests, we expanded existing import and export to be compatible with data and database requirements and then built a converter that transforms needed data into .csv and .xls format. A sales manager can download all client requests made for a previous day to process manually and then upload them back to the system. Data audit. Out-of-the-box report of all the actions, performed with records. All the changes can be tracked down, which is very important for this project since a lot of information is edited manually by lots of people. For example, a sales manager can edit a lead manually by customer request via email or phone call. He searches for it by using filters and finds a customer in OroCRM in less than a minute and edits any information on him, if, for example, there is a mistake in given information or a customer wants to change a status of his order. All the changes history is saved and can be viewed within OroCRM. Audit on separate pages was improved to add better support of relation types and to show changes in required parameters for related entities as well. In pursuit of innovation and claiming new source of sales, a European car manufacturer gave us a challenging task to develop a CRM (customer relationship management) solution, altered to the needs of motor vehicle trade specifics. Default functionality of OroCRM has a resource to implement this idea into life, and that’s why we chose it — what we had to do was to customize it to our clients needs. In a previous case study part we have been talking about features that will be mostly used by our clients’ sales department, but we also haven’t forgotten about marketing department. 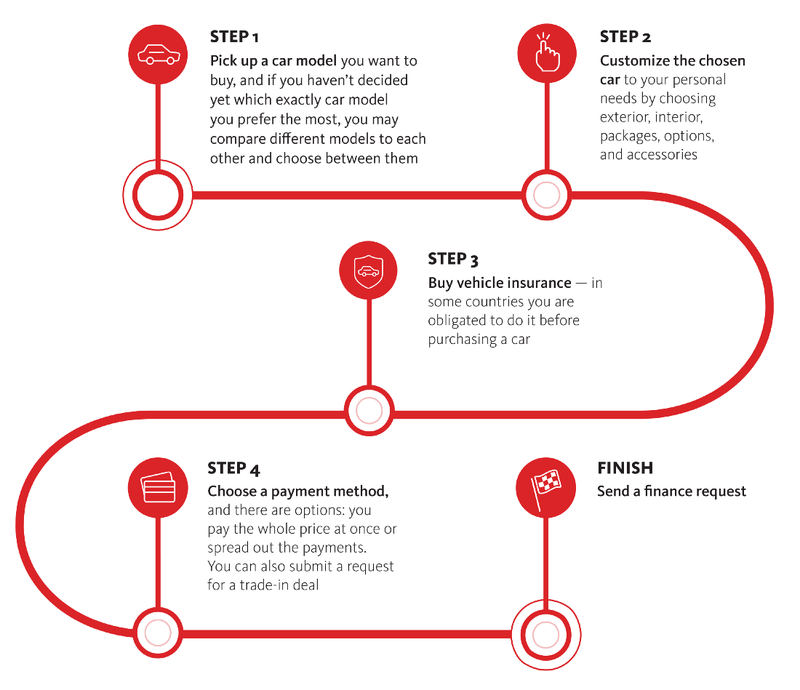 So, here are tips on how to drive customer loyalty in OroCRM by the example of the car market. Car brand loyalty depends on a whole lot of different factors. A well-designed customer loyalty program has the power to transform your business. If you need arguments in favor of this idea: it costs 5 times more to attract new customers than it does to keep current ones. OroCRM provides 5 basic tools to manage customers and drive loyalty. In its default functionality OroCRM website tracking remembers which products or categories your customer is browsing, which pages they visited, and which items they added to their cart. The tracking engine is also capable of recognizing anonymous activity and connecting it to customer accounts once created. In our particular case, there is a configurator on the site that is designed for customers to pick up a car model and then customize it to a personal needs. The customer has to choose engine type, exterior, interior, packages, options, and accessories, and it’s not necessarily that he does all of it at one site visit. The customer may visit the site multiple times before he decides to make a purchase. Customer behavior tracker for this project is customized in a way to save an information on actions that request confirmation in order to proceed. For example, a user have chosen an exterior, clicked “Next step” and passed to selecting an interior. All the data is aggregated by marketing analytics system and then is send to OroCRM. Collected data will be used by the client for various purposes. How will this data be used? Here are our use cases. The user can revisit the site and proceed with his order at the same place with same options he got interrupted a previous time. The data is recorded by marketing analytics system and afterward moved and processed by OroCRM. Then finance data app identifies the client, finds and restores the options on order based on data retrieved from OroCRM’s API. Marketing department of a European car maker uses collected data for creating refined customer segments and launching advanced targeting campaigns. Social media allows launching advanced targeting campaigns where you can target customers by uploading an information on people who visited your website, so they see personalized advertising content — in this particular case, a commercial of a car model they have been viewing on the site. The client also needs his potential customers to be organized into meaningful groups to make personalized offers. Marketing department uses collected data to analyse global user behavior in order to improve UX. Thanks to customer behaviour tracker it is possible to monitor at which step users are mostly leaving the website or how many visits to the site it usually takes for a customer to to make an order, and if customers are too slow and decisions hesitant, you can improve user experience by searching for mistakes and fixing them. Customer segmentation is a fundamental thing for implementing marketing campaigns with the successful output. In its simplest form, it is dividing customers into groups of people with different values and priorities and willingness to pay. It allows set up marketing activities exactly to the customer needs: that way you can explore overall market dynamics, match products to customer preferences and establish better public relationships. There is a multi-selection option, so you can, for example, get information on those customers who had purchased sports utility vehicles and then got into accidents or purchased luxury vehicles and paid for them in cash. OroCRM generates a datagrid that can be exported in csv. or xls. format and then be used for different marketing purposes. You can then go further and create customer profiles to reach target audience — that’s possibly the best way to take a closer look at who your customers are and compare your expectations to reality. To create a buyer persona you have to describe his/hers demographics, psychographics and behavior. After that, you can relevantly speak to your audience. Marketing lists will be created and then used for the purpose of identifying customers to target using OroCRM’s built in email campaign feature. Different customer segments are going to get newsletters with personalized content. If you have a compact MPV (multi-purpose vehicle) in your garage, you will most likely receive an e-mail with tips on going to a road trip with your family and if you have a SUV, you’ll get rallying news, analysis and stats. After you have established segments and launched campaigns, you have to measure its effectiveness and determine returns on investments. In OroCRM you can compare different marketing campaign effectiveness which optimizes your marketing strategy and also improves user productivity as now all users will be looking at the same information and same product. There is no need for a constant sync-up. The thing is, our client has representative offices in countries all around the world, which are responsible for launching campaigns on local markets — usually, it’s done with the assistance of digital agencies, and they do their own reports which are sent to local departments. We solved this problem by making different user roles and accesses for those who work in digital agencies, so they can launch campaigns and measure the results right through OroCRM. Though selling cars is harder than selling probably any other consumer goods due to a complexity of the product and price tag, RFM (Recency, Frequency, and Monetary) analysis is still going to be used on the project in its default functionality to assess consumer usage and attitudes. The client can use RFM analysis to monitor VIP customers who have spent “x” amount of dollars or those who purchased. In pursuit of innovation and claiming the new source of sales, a European car manufacturer gave us a challenging task to develop a CRM (customer relationship management) solution, altered to the needs of motor vehicle trade specifics. Default functionality of OroCRM has a resource to implement this idea into life, and that’s why we chose it — what we had to do was to customize it to our client’s needs. Previously we have been talking about how the data is stocked within OroCRM and how it will be used by sales and marketing departments. Despite the fact that OroCRM aggregates data from all kind of sources and will be used by people from different departments, it is still very easy to use thanks to various groups, different permissions and limitations — for each group of users OroCRM will look differently and have only the information you need — nothing that is unnecessary. For now this OroCRM integration project will be used by the client in one European country only, but there are plans of making it accessible to an international market trade. 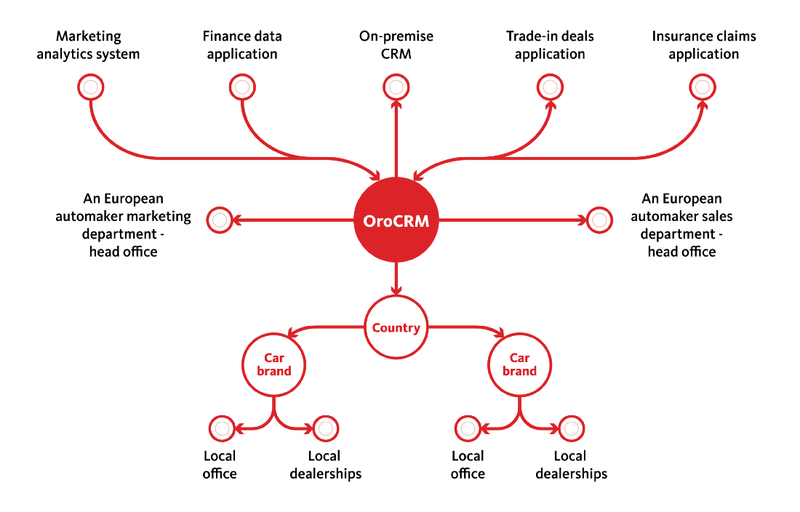 Expandable and flexible, OroCRM allows us to connect to the system local offices and dealerships all around the world, even the factory where cars are built, if you like. And that’s what we believe will happen eventually. We already showed you how data flow is organized between internal/external systems and OroCRM. Let’s now go a little deeper and explore how we applied access and permissions management to keep all the data in perfect order. 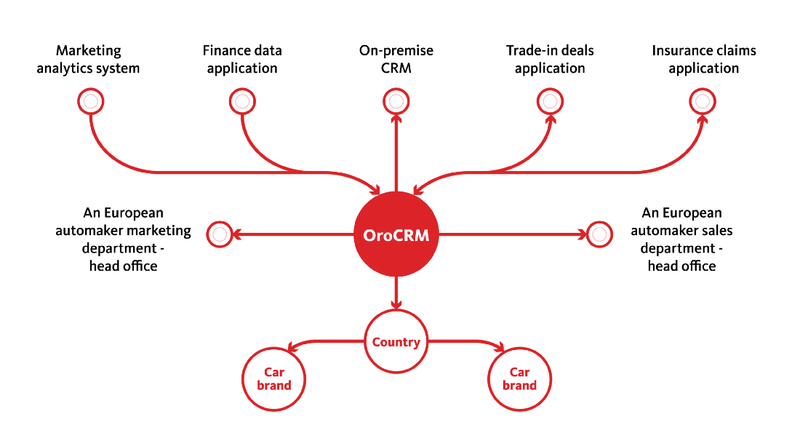 The main access to OroCRM — to all the data on past, current and potential customers in countries all round the world — belongs to the members from a European automaker head office. We set different user roles for marketing and sales departments, so there is nothing unnecessary, only data related specifically to their area of work. Just as we already said, for now, the project is going to be launched in the one European country only, but if everything goes successfully, it will be broadened for an international usage. That means we will have to arrange data within OroCRM in such a way as to give a detached access for sales and marketing managers from each country, so they see only the information on a local trade market. But that is not all. Another thing we have to keep in mind is that our client — a European car maker — manufactures multiple car brands that are juridically considered to be different business units, which means same solution with giving a detached access can be implemented over and over again. Just as we set different user roles for marketing and sales departments from the head office, we do the same thing for marketing and sales departments of local offices. Previously our client was not able to get a full 360-degree view of their customers and prospects, but now with OroCRM sales department is able to view all information from one view (i.e. insurance claims, trade-in views, what customers are viewing, etc. ), as well as OroCRM brings value to marketing teams by enabling more targeted segments for marketing campaigns.